We’ve been at the pool a lot, these first two-and-a-half weeks of vacation. We went on Sunday with my parents, and yesterday we went to a nearby town’s pool with our former babysitter. It’s a whole different story this year as opposed to last: my oldest has the run of the whole pool complex, and the younger two can swim independently with their life jackets on in the big pool. Of course they want to jump to me and show me what they can do, and ride piggyback on me. But I love being sprung from the baby pool. No more sitting on the edge with my feet in the water while my upper half bakes, flinching when other toddlers spray me with water pistols. I can, and do, bob in the big pool for hours while the bodies torpedo into the water nearby. Something about watching the sun starting to set behind the houses on the western side of the complex reminds me of the street where I grew up, although the houses don’t look the same. Maybe it’s just being in the pool that makes me feel like a kid. Then when we get home, we revel in that delicious post-pool exhaustion. The kids can play Wii, watch TV, whatever. They’ve earned it! We were just outside for like four hours! I’m grateful to have such a pleasant pool to go to, and grateful we can afford it. 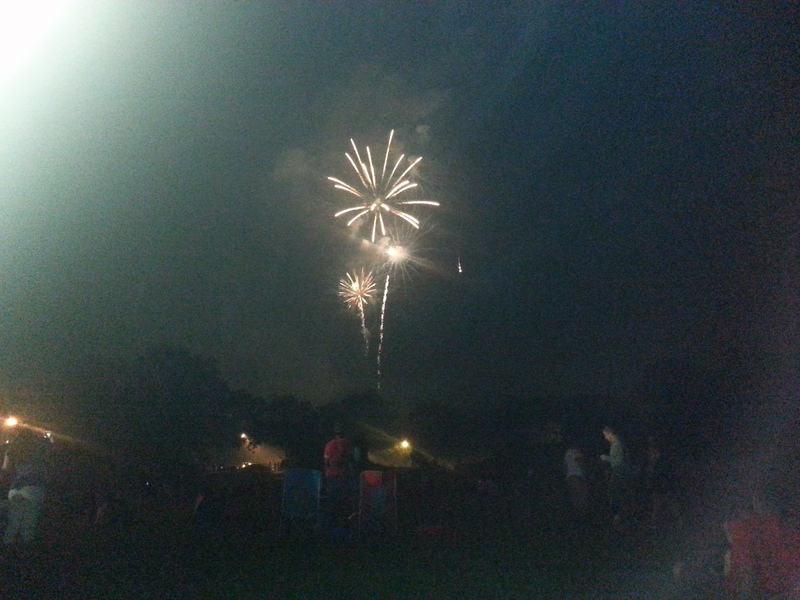 We had a nice Fourth of July. The weather was better on Friday than Saturday. The kids and I went to the hardware store to get new pegs for the big blow-up slide pool. It lived again, gloriously, for Friday afternoon and about an hour Saturday morning. Then it seemed to suffer several holes at once and completely fail. So we are debating what to do about that. I enjoyed putzing around the yard, gardening and decorating for the holiday, on Friday while the slide kept them busy. I even sat down in the lounge chair with a Landshark for 15 minutes. For Friday’s dinner, I sautéed shrimp in the garlic-and-herb version of Old Bay, and baked some of my very own yellow squash, with oil, garlic and freshly grated Parmesan. 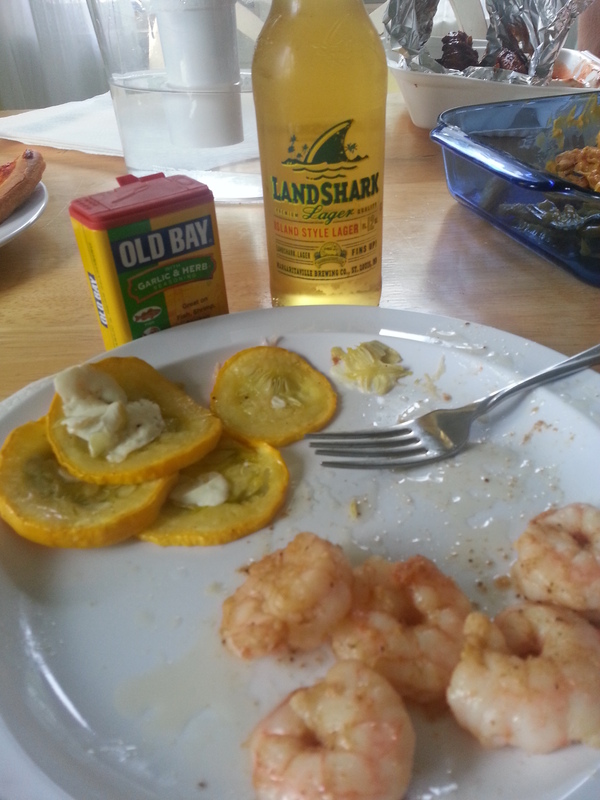 Such a perfect summer meal. We all stayed up late shooting off the fireworks from Maryland. Saturday, I made deviled eggs for a BBQ at my parents’, and I brought them the half-squash that was left, as well as lettuce from the garden. The kids had a good time with their cousin and uncle, playing football out front most of the time. I ate too much. 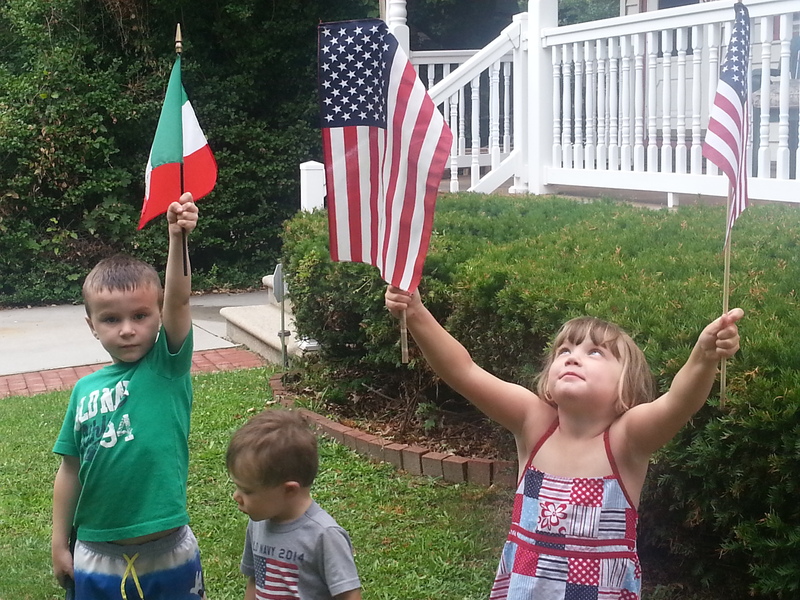 The boys and I made it to our town’s fireworks that night, but baby girl did not. Since the weekend, I’ve been trying to eat up the lettuce. I used some for a turkey sandwich and some for a salad last night with dinner. 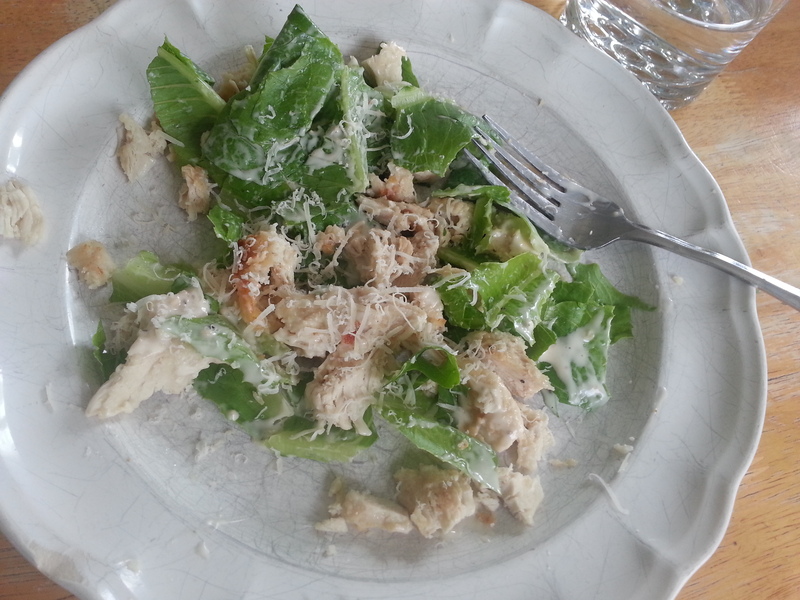 Today’s lunch was a chicken Caesar salad with chicken leftover from last night. Mmm, food is so good lately. Going to Wegmans is rejuvenating my palate and also probably making me gain five pounds. Brioche rolls for turkey sandwiches? Yes please. Shrimp tempura sushi for lunch, instead of a tuna fish sandwich? You got it mama. You deserve it. I definitely need to rein in expenses, or the latter half of summer is going to be pitiful. Things like buying food at the pool’s snack bar, or suddenly deciding to take the kids out for pizza for lunch in the midst of running errands, are adding up. We went to the movies Monday afternoon, to see Inside Out. We had free passes to the show (thanks to a fundraiser we attended), but I spent a lot at the snack bar. Whereas during the school year, I was often legitimately too busy to cook from scratch, hang wash on the line, and do other frugal/natural things, now we have lots of time — so much time that boredom/itchiness drives us out of the house eventually and leads us into spending temptation. OK, not us. Me. I get bored. Today is rainy, so no pool. For fun, we took the minivan to the inspection station, bought new shoes at Burlington Coat Factory, and went and looked at the pets at Petco. Then we came home and had lunch. I took a shower, then we all played football outside until it started to rain again. Then we had “job time,” which basically I institute at that point every day where the house starts to look extra messy and the kids seem at loose ends. (My oldest still has some jobs that he is supposed to do automatically, but some have rotated back into the job pool at large for the summer.) Job time took us through to TV time/Mommy blogging time. And Daddy decided he wanted pizza for dinner, so he is bringing it home for dinnertime. Amidst all that, I was doing load after load of wash, defusing a crisis involving something lost in the mail, and researching some PTA stuff. I really love waking up and having no set plans, nowhere to be. Summer! I love you right now.